This article is about the NFL quarterback. For the American soccer (association football) player, see Matt Kassel. Matthew Brennan Cassel (born May 17, 1982) is an American football quarterback for the Tennessee Titans of the National Football League (NFL). He was drafted by the New England Patriots in the seventh round of the 2005 NFL draft, and has also played for the Kansas City Chiefs, Minnesota Vikings, Buffalo Bills, and Dallas Cowboys. He played college football at USC. Cassel became the Patriots' starting quarterback after Week 1 of the 2008 season after then reigning NFL MVP Tom Brady suffered a season-ending knee injury. According to ESPN research, he is the only known quarterback in NFL history to start an NFL game at quarterback without ever starting as quarterback in college. In February 2009, the Patriots used their franchise tag on Cassel, extending him a one-year contract worth over $14 million, the largest one-year contract for an offensive player in NFL history. Later that offseason, the Patriots made a trade which sent Cassel to the Kansas City Chiefs, who signed him to a 6-year, $62.7 million contract in July 2009. In 2010, Cassel led the Chiefs to their first divisional championship in seven years, and earned a Pro Bowl berth in the process. He attended Chatsworth High School and was a letterman, an all-city selection, and a standout in both football and baseball. As a senior, he was ranked as the number eight quarterback and number 53 overall of the top high school players in the nation according to ESPN's Tom Lemming's Top 100. Lemming called Cassel a "pro-style pocket passer with a very strong, accurate delivery." In addition to playing quarterback, Cassel was also Chatsworth's punter. Cassel committed to play at USC before starting his senior year in high school. Cassel began his college career in 2001 and spent that entire Trojan career as a backup behind Heisman Trophy winners Carson Palmer and Matt Leinart. Cassel was the backup for Palmer during his Heisman-winning 2002 season. In the fall, Cassel lost the battle for the starting position to the previous third-string quarterback in Leinart. 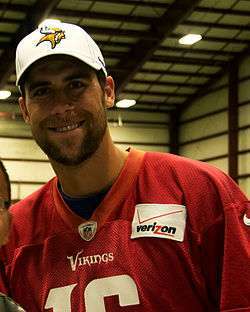 As a result of Leinart's success, Cassel spent time at tight end and wide receiver in 2003, and some special teams that year. He made his lone collegiate start at H-back against California in 2001. During his four seasons at USC, Cassel completed 20 of 33 passes for 192 yards, with no touchdowns and one interception. Cassel, a communication major at USC, was also roommates with Pittsburgh Steelers safety Troy Polamalu, now retired, and Carson Palmer. Cassel played one season of baseball for USC in 2004, compiling an 0–1 record with 10 strikeouts and 4 walks. He played in 8 games and started 1. Cassel struck out in his only at bat in college. He also had 2 saves with a 9.35 ERA, and was selected by the Oakland Athletics in the 36th round of the 2004 MLB Draft. 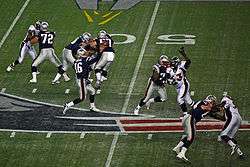 In the Patriots' final game of the 2005 regular season, a 28–26 loss to the Miami Dolphins on January 1, 2006, Cassel played the final three quarters. Though he was sacked for a safety, he threw two touchdown passes, one to Tim Dwight, and the second to Benjamin Watson. The pass to Dwight set up a drop-kick by Doug Flutie, the first such kick since 1941. In Week 16 of the 2006 season, after injuries to Josh Miller and Ken Walter, Cassel assumed duties as holder for kicker Stephen Gostkowski. He also led a late touchdown drive in Week 17 against the Tennessee Titans. In Week 7 of the 2007 season, Cassel's second pass was intercepted by Jason Taylor of the Miami Dolphins and returned for a touchdown. The next week, with the Patriots leading the Washington Redskins 45–0, he capped off the 52–7 blowout with a 15-yard touchdown run in which he dove over two Washington defenders to reach the end zone. 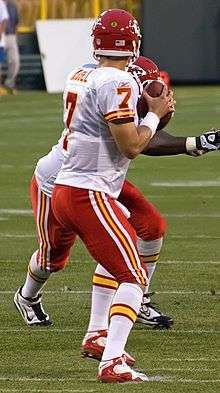 In the 2008 season opener against the Kansas City Chiefs, Cassel came under center when Brady suffered a torn ACL and MCL in the first quarter from a hit by Chiefs safety Bernard Pollard. Cassel led the Patriots to a 17–10 victory, completing 13 of 18 passes for 152 yards and one touchdown; Cassel's drives accounted for all of New England's points. Cassel made his first-ever start on Sunday, September 14, 2008, with a winning effort over the New York Jets, completing 16 of 23 passes for 165 yards; though he threw no touchdowns, he also threw no interceptions. The Patriots' 19–10 victory was the first time in six tries that a quarterback making his first NFL start defeated a team led by Brett Favre. Cassel scored the second rushing touchdown of his career on a 13-yard touchdown in Week 10 against the Buffalo Bills. Cassel had zero touchdowns, but also zero interceptions, as he led the Patriots to a 20–10 win; the Patriots held the ball in the game for over 37 minutes; the final 19-play drive, which lasted over 9 minutes, tied a franchise record for most plays in a single drive. In Week 12, Cassel led the Patriots to a 48–28 win over the Miami Dolphins, who in Week 3 had ended the Patriots' NFL record 21-game regular season win streak. While Cassel threw for just 131 yards in the Week 3 loss, his Week 12 performance topped his performance against the Jets: Cassel completed 30 of 43 passes for 415 yards, three touchdowns to Randy Moss, and one interception, for a passer rating of 114.0; Cassel also had 14 yards on two rushes, including an 8-yard touchdown run. The performance made Cassel the first quarterback in franchise history, and only the fifth quarterback in NFL history, to have consecutive games with 400+ yards passing. His efforts earned him the title of AFC Offensive Player of the Week for the second time. In Week 15, against the Oakland Raiders, Cassel, playing just six days after the death of his father, set a new personal best, throwing for four touchdowns in the Patriots' 49–26 rout. Cassel during the 2008 NFL season. In Week 17, Cassel led the Patriots to their fourth consecutive win, 13–0 over the Buffalo Bills in a game marked by winds so severe that they bent the goalposts both before and during the game. Cassel completed 6 passes out of just 8 attempts, the second-lowest attempt total in franchise history (the lowest being the 5 attempts of the 1982 Snowplow Game). Cassel finished with 78 yards, zero touchdowns, and zero interceptions; his most notable play, however, was a quick kick punt on third down in the fourth quarter; with the wind at his back, Cassel's kick landed inside the 20, and then rolled towards the Bills' end zone before it was downed, stranding the Bills at their own 2-yard line, struggling against the wind, down two scores with five minutes remaining. Cassel, in the last year of his four-year rookie contract, was scheduled to be an unrestricted free agent in 2009. Given the quality of his performance, and the uncertainty over Brady's recovery, NFL analysts and reporters raised the question of whether the Patriots should, or would, franchise Cassel, less than three months after some of those same reporters predicted Cassel would be cut from the team. On February 28, 2009, the Patriots traded both Cassel and OLB Mike Vrabel to the Kansas City Chiefs for the No. 34 overall selection in the 2009 NFL Draft. NFL Network's Adam Schefter (now with ESPN) described as "one of the wilder and more complex behind-the-scene dramas the NFL has seen in any recent offseason," with the Tampa Bay Buccaneers proposing a three-way trade with the Denver Broncos, in which the Buccaneers would have received Broncos quarterback Jay Cutler, the Broncos would have received Cassel, and New England would have received a first-round draft pick. Cassel then briefly became teammates with Bernard Pollard, the player whose hit in 2008 caused Brady's injury and subsequently made Cassel the starter that season. In an interview, Cassel said he would "thank" Pollard for the opportunity, but also stated that he believed the hit on Brady was "unintentional" and he never wishes to see anyone get hurt while playing. On July 14, 2009, the Chiefs signed Cassel to a six-year, $62.7 million contract that includes $28 million in guaranteed money, and $40.5 million in total compensation in the first three seasons. In 2010 Cassel had a resurgent season starting with a 21–14 victory over the San Diego Chargers in the opening week's Monday Night Football late game at home in Arrowhead. Cassel would build off of this start helping guide the Chiefs to a 7–4 record over the first 12 weeks of football. Due to his form during November, he was named AFC Offensive Player of the Month for November. Cassel completed 90 of 144 passes (62.5%) for 1,111 yards and an NFL-leading 12 touchdowns, with just one interception. He had a 111.2 quarterback rating for the month. As a result of his performance against the Seattle Seahawks, Cassel won the FedEx Air & Ground NFL Players of the Week award, as voted by the fans. On December 8, 2010, Cassel underwent an emergency appendectomy. It was unclear at the time whether he would be able to play in that week's game against the San Diego Chargers. The Chiefs ended up starting backup Brodie Croyle and lost the game 31–0. Cassel would return the next two games however and would lead the Chiefs to landslide wins over both the St. Louis Rams in the Governors Cup and then at home against the Tennessee Titans. The 34–14 win over the Titans, along with a loss by the Chargers to the Bengals, helped the Chiefs clinch the division title. This would be the first Chiefs playoff game in four years and the first home playoff game since 2003, the last time the Chiefs won the AFC West division. In a home playoff 30-7 loss against the Baltimore Ravens, Cassel went 9 of 18 for 70 yards passing, zero touchdown passes, and three interceptions. In January 2011 Cassel was named as an alternate to the Pro Bowl in place of an injured Tom Brady. Cassel threw for two touchdowns and two interceptions in the Pro Bowl. In 2011, Cassel had led the Chiefs to a 4–4 record. During the first two games, Cassel only threw one touchdown. Those first two games were blowout losses. In the second game, Cassel threw three interceptions. Cassel finally had his first good game, throwing two touchdowns in a 17–20 loss against the Chargers. He led the Chiefs to their first win against the Vikings, where he threw for 260 yards and one touchdown. The next week, he led the Chiefs to a comeback victory against the Colts. The Colts jumped to a 17–0 lead, but Cassel threw four touchdowns and 257 yards with no interceptions to lead the Chiefs to a 28–24 win. After the game, Cassel had a 138.9 quarterback rating. In week 8, Cassel threw one touchdown though throwing two interceptions. Cassel injured his hand in a week 10 game vs. the Denver Broncos. He was replaced by Tyler Palko, and had surgery on the injured hand on November 14. On November 21, he was placed on injured reserve, ending his season. In Week 1 of the 2012 season, Cassel had a tremendous first half against the Atlanta Falcons, but threw two interceptions in the second half. His final stats were two interceptions, one touchdown, one rushing touchdown, and a 72.5 quarterback rating. The final score resulted in a Chiefs loss, 24-40. The Chiefs had to rely on a 91-yard run by Jamaal Charles, a safety, and four field goals to gain their first win against the New Orleans Saints, as even with excellent field position throughout the second half, Cassel could not lead the team to the endzone; he threw one interception and no touchdowns. The final score of that game was a 24-27 overtime win for the Chiefs. The next week, Cassel struggled and threw two touchdowns, but three interceptions in a 20-37 Chiefs loss against the Chargers. After the game Cassel's starting job appeared to be in jeopardy, but coach Romeo Crennel said Cassel would start the next game against the Ravens. On October 7, 2012 against the Baltimore Ravens, Cassel left the game with a head injury. Earlier in the day, a group called Save Our Chiefs rallied fans together and flew a banner over Arrowhead calling for the General Manager Scott Pioli to be fired and for Cassel to be benched. On October 11, 2012 Chiefs head coach Romeo Crennel announced Cassel had been ruled out of the October 14, 2012 game against the Tampa Bay Buccaneers and named Brady Quinn the starter for the game. At the time of Cassel's injury, he had accumulated nine interceptions and five fumbles through the first five games of the season. This mark was more than any other team in the NFL, except the Philadelphia Eagles, who also had fourteen turnovers in their first five games of the 2012 season. On October 22, 2012, Crennel named Quinn as the starting quarterback for the Chiefs following their bye week. Cassel was deemed healthy enough to play, but still given the backup role. On March 13, 2013, sources close to the Chiefs reported they intended to trade or release Cassel. On March 14, 2013, the Chiefs released Cassel. On the same day he was released from the Chiefs, Cassel signed with the Minnesota Vikings. On September 27, it was announced that Cassel would get his first start as a Viking in Week 4 vs the Pittsburgh Steelers, due to a rib injury to starting quarterback Christian Ponder. The Vikings won the game 34–27. Due to another injury to Christian Ponder, Cassel received his third start of the season week 14 against the Baltimore Ravens. Despite a two touchdown, zero interception performance, the Vikings lost to the Ravens 29-26 during a heavy snow game. He would remain the starting quarterback the rest of the season where the Vikings finished at 5-10-1 and Cassel either played the whole game or came in to rally the Vikings from behind in all five victories. On March 7, 2014, it was reported that Cassel had signed a new two-year deal for $10 million. It was later announced on August 25, 2014 that Cassel would be the starting quarterback over rookie Teddy Bridgewater and Ponder. However, on September 21, 2014 Cassel broke his foot against the New Orleans Saints and was placed on injured reserve. On March 10, 2015, the Vikings traded Cassel along with a sixth round 2015 NFL Draft pick (#188-Tony Steward) to the Buffalo Bills in exchange for a 2015 fifth round pick (#137-Grady Jarrett) and a seventh round pick in 2016 (#137-Alex McCalister). Cassel was involved in a three-way quarterback competition between former Bills first round pick EJ Manuel and former Baltimore Ravens backup Tyrod Taylor. After losing the competition to Taylor, he was released by the Bills on September 5, 2015. However, he was re-signed three days later to back up Taylor. Cassel was credited as the Bills' starting quarterback for the season opener due to him taking the team's first snap on offense in the wildcat formation with Tyrod Taylor lined up at wide receiver. On September 22, 2015, the Bills traded Cassel to the Dallas Cowboys after Tony Romo suffered a broken collarbone. In addition to Cassel, the Cowboys also received Buffalo's 2017 seventh round pick in exchange for Dallas' 2017 fifth round pick. Although Brandon Weeden was expected to start, the Cowboys covered themselves by also trading for Cassel. After Weeden lost the 3 games he started, Cassel replaced him as the starting quarterback while the injured Romo continued to rehab. He was never able to have any sustained offensive success and was prone to critical errors. 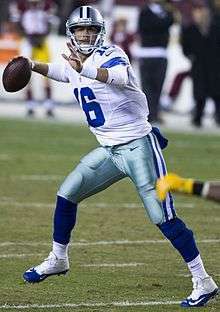 On December 19, after a disastrous showing against the New York Jets, Cassel was benched and replaced by Kellen Moore for the game and the rest of the season. In his seven starts and eight appearances, he posted a 1-6 losing record, 1,276 passing yards, 5 touchdowns and 7 interceptions. On Cassel's last play before being benched for Moore, he became the first quarterback in over twelve years to throw an interception that was also flagged for intentional grounding. The play was designed to be a WR bubble screen, but Cassel held onto the ball after a pump-fake, then turned to look at the other side of the field. Forced to scramble to get away from the immediate pressure, thanks largely to most of the Dallas offensive linemen moving to the left side of the field to block for the presumed WR screen, Cassel stumbled and nearly fell over. Trying to salvage the play, Cassel threw the ball towards the right sideline. No Dallas receiver was in the area, and the ball failed to reach the sideline and was intercepted by Darrelle Revis. On top of the intentional grounding call against Cassel, there was also an illegal lineman downfield call against Dallas, as several offensive linemen had run downfield to block for what they assumed was a quick screen pass to a receiver. Both penalties were declined so that the interception would stand. Cassel signed with the Tennessee Titans on March 10, 2016. Cassel has three siblings: older brother Jack (who is married to Killian's USC roommate and teammate, Julie Mariani), younger brother Justin, and younger sister Amanda. Jack pitched for the Houston Astros in 2008 and signed in January 2009 with the Cleveland Indians. Justin is a pitcher for the Charlotte Knights, a AAA baseball affiliate of the Chicago White Sox. ↑ "Cassel likely to remain in New England". Blogs.nfl.com. 2009-02-07. Retrieved 2011-06-05. ↑ Later in the 2009 franchise period, the Carolina Panthers franchised Julius Peppers, which required a salary of over $16 million. 1 2 King, Peter (2009-02-28). "Chiefs complete trade for Cassel". Sports Illustrated. Retrieved 2009-02-28. ↑ "Peter King—Chiefs, Rams players lend hand to tornado recovery effort in Joplin". SI.com. 2011-05-30. Retrieved 2011-06-04. ↑ "Exit Interview: Matt Cassel". Scout.com. 2005-03-21. Retrieved 2006-08-12. ↑ "Recruiting: Tom Lemming's Top 100". ESPN.com. 2000-02-21. Retrieved 2008-11-19. 1 2 "QB had to throw caution at the wind". Boston.com. 2008-12-29. Retrieved 2011-06-05. ↑ "Four of a Kind". Articles.latimes.com. 1999-08-25. Retrieved 2011-06-05. ↑ "Carson Palmer on Matt Cassel". Nfl.com. 2008-09-10. Retrieved 2011-06-05. ↑ "Matt Cassel Stats – ESPN". Sports.espn.go.com. 1982-05-17. Retrieved 2011-06-05. ↑ Brown, Scott (2008-11-28). "Parker back to practice". Pittsburghlive.com. Retrieved 2011-06-05. ↑ "NFL Videos". Retrieved 23 December 2015. ↑ "2004 MLB Draft Results Round 36 | MLB Draft Results | 2004 MLB Amateur Draft Picks". Mymlbdraft.com. Retrieved 2011-06-05. ↑ "Matt Cassel - Southern California, QB : 2005 NFL Draft Scout Player Profile". Retrieved 23 December 2015. ↑ Peter, Josh (2011-06-01). "Cassel finally gets his shot". Sports.yahoo.com. Retrieved 2011-06-05. ↑ Battista, Judy (2008-09-09). "Belichick Declines to Sign Simms and Rattay". Nytimes.com. Retrieved 2011-06-05. ↑ Martone, Art. "Transcript: Matt Cassel's Thursday press conference (September 11, 2008)". Beloblog.com. Retrieved 2011-06-05. ↑ "Cassel named AFC Offensive Player of the Week". Reiss' Pieces, The Boston Globe. 2008-10-22. Retrieved 2008-10-22. ↑ "NFL game stats". Nfl.com. Retrieved 2011-06-05. ↑ "Cassel is AFC Offensive Player of the Week". Reiss' Pieces, The Boston Globe. 2008-11-26. Retrieved 2008-11-26. ↑ "NFL Game Center: New England Patriots at Oakland Raiders – 2008 Week 15". Nfl.com. Retrieved 2011-06-05. ↑ "Worcester Telegram & Gazette – telegram.com – Snow problem". telegram.com. Retrieved 2011-06-05. ↑ Somers, Kent (2008-12-21). "Leinart, Cassel continue role reversals". Azcentral.com. Retrieved 2011-06-05. ↑ "NFL GameDay: Patriots vs. Bills". Nfl.com. 2008-12-28. Retrieved 2011-06-05. ↑ Reiss, Mike (2008-11-18). "King of the Cassel". The Boston Globe. ↑ Reiss, Mike (2008-08-30). "Updated 53-man roster projection". The Boston Globe. ↑ "Sources: New England Patriots to put franchise tag on Matt Cassel – ESPN". Sports.espn.go.com. 2009-01-05. Retrieved 2011-06-05. ↑ "Patriots Franchise Cassel". Boston.com. 2009-02-05. Retrieved 2011-06-05. ↑ "Cassel to make $14.65M next season". Sports.espn.go.com. 2009-02-09. Retrieved 2011-06-05. ↑ Schefter, Adam (2009-02-28). "Cutler upset over potential deals to Detroit, Tampa Bay". NFL.com. Retrieved 2009-02-28. ↑ "Snap Judgments: Chiefs' Cassel at ease with role as face of franchise". SI.com. 2009-08-01. Retrieved 2009-08-03. ↑ John Clayton (2009-07-14). "Chiefs lock up Cassel". ESPN.com. Retrieved 2009-07-15. ↑ "Haley: Cassel (knee) a question mark". ESPN.com. Associated Press. 2009-09-16. Retrieved 2009-09-17. ↑ "Kansas City 24, Baltimore 38". ESPN.com. Associated Press. 2009-09-13. Retrieved 2009-09-17. ↑ "Cassel picks up pace in practice". ESPN.com. Associated Press. 2009-09-16. Retrieved 2009-09-17. ↑ Matt Looney (2010-12-01). "Arrowhead Report: Thursday, December 2nd". ESPN.com. Retrieved 2010-12-02. ↑ "Cassel, Hillis voted FedEx Air & Ground Players of the Week". NFL.com. Retrieved 2010-12-05. ↑ Sean Leahy (December 8, 2010). "Chiefs QB Matt Cassel undergoes appendectomy". USA Today. Retrieved 2010-12-08. 1 2 Adam Teicher (2010-12-27). "Chiefs on their way to playoffs with win over Titans". Kansas City Star. Retrieved 2010-12-27. ↑ "The Chiefs banner flies at Arrowhead". Retrieved 7 October 2012. ↑ "Quinn to start for Chiefs on Sunday". Retrieved 22 October 2012. ↑ "Matt Cassel on Kansas City Chiefs' trading block". NFL.com. ↑ "Matt Cassel agrees to Minnesota Vikings contract". NFL.com. ↑ "Matt Cassel to start for Vikings over Christian Ponder". NFL.com. Retrieved 23 December 2015. ↑ Goessling, Ben. "Matt Cassel, Vikings reach new deal". ESPN.com. Retrieved 7 March 2014. ↑ "Matt Cassel will start Week 1 for Minnesota Vikings". NFL.com. ↑ Goessling, Ben (September 24, 2014). "Vikings place QB Matt Cassel on IR". ESPN.com. Retrieved September 24, 2014. ↑ Rodak, Mike (March 4, 2015). "Bills trade for Matt Cassel". ESPN. ↑ "Bills officially acquire QB Cassel from Vikings in trade". BuffaloBills.com. March 10, 2015. ↑ Orr, Conor (September 5, 2015). "Buffalo Bills release QB Matt Cassel". nfl.com. Retrieved September 5, 2015. ↑ Hanzus, Dan (September 8, 2015). "Bills re-sign Matt Cassel to back up Tyrod Taylor". nfl.com. Retrieved September 24, 2015. ↑ Alper, Josh (September 13, 2015). "Matt Cassel "starts" at quarterback for the Bills". profootballtalk.nbcsports.com. Retrieved October 15, 2015. ↑ Around the NFL staff (September 22, 2015). "Cowboys trade for bills qb Matt Cassel". nfl.com. Retrieved September 22, 2015. ↑ "Matt Cassel to start at QB for Dallas Cowboys after bye week". ESPN.com. Retrieved 23 December 2015. ↑ "Matt Cassel benched, Kellen Moore is Cowboys' fourth QB this year". Yahoo Sports. 20 December 2015. Retrieved 23 December 2015. ↑ Crouse, Karen. "For Cassels, Athletics Are Part of the Family". New York Times. Retrieved 4 January 2014. 1 2 Boston Globe (2008-09-14). "After years as a backup, he hands off clipboard". The Boston Globe. Retrieved 2008-12-11. ↑ "Patriots unsure when Cassel will return after father's death". Associated Press. 2008. Retrieved 2008-12-11. ↑ Justin Unell (January 30, 2012). 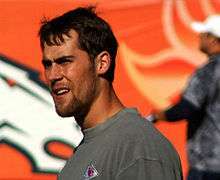 "Chiefs quarterback Matt Cassel helps rescue family from fire in Loch Lloyd". KSHB. 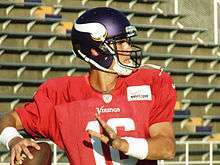 Wikimedia Commons has media related to Matt Cassel.